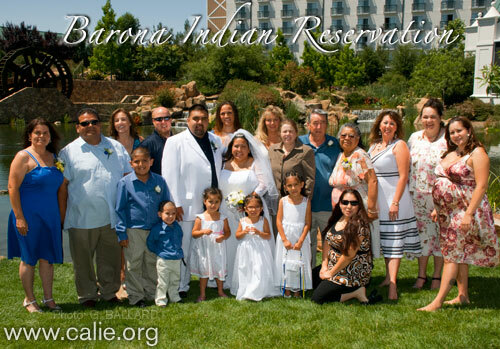 Barona photo pictures a large wedding party and family photograph spring wedding — two Native American families join together and become one. This is a glorious day for a wedding. The sun is shining and the steady Barona breeze is keeping the air clean so you can see the surrounding mountains clearly. This is a fine day at 1pm May 28, 2008 to do things rightly. 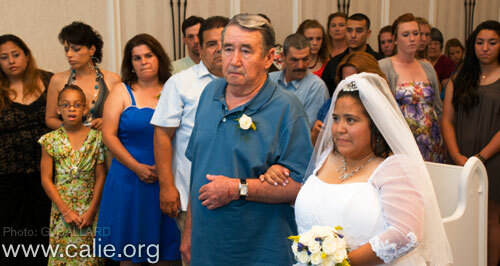 Leroy Elliott, Manzanita Tribal Chairperson, is officiating at this traditional Indian wedding of Miss Rietta Marie Carmen, Maidu and Mr. Norman Eugene Amador, Pascua Yaqui. The couple has been together for some time. 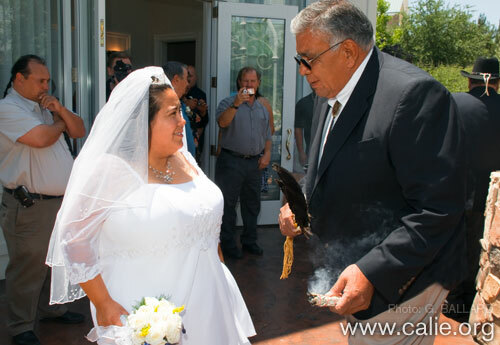 Chairman Leroy Elliott smuged the groom and bride before the ceremony with burning white sage smoke and an eagle-feather prayer fan. 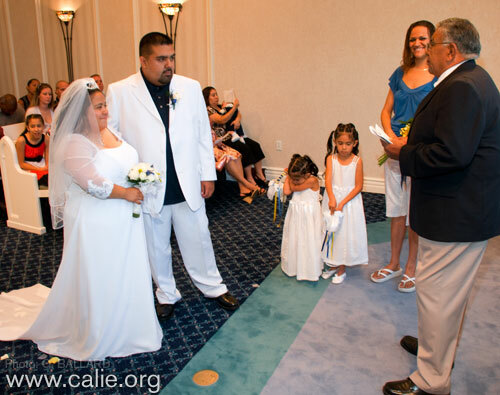 Mr. Elliott purifies the couple and counsels them on this step in their life they are taking for themselves and their family. Inside the chapel there are feelings of excitement and anticipation. 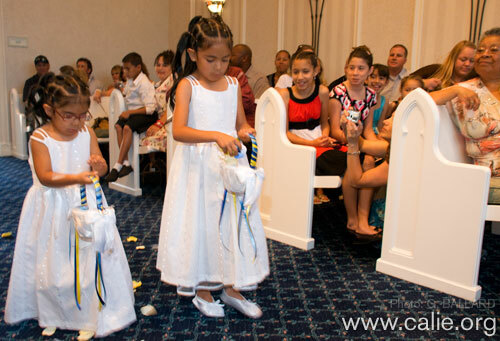 Laughter bubbles up and a lot of children and smiles are seen in every pew and corner of the Barona Wedding Chapel. Preceding the exchange of vows Leroy calls upon Devon Alto, Tipai, and Louis Guassic, Ipai, to sing four appropriate Tukuk Bird songs for the occasion. Vows and kisses completed the happy married couple exit to more laughter and bubbles of rainbow colors and lifted hearts. Ernie Salgado, Luiseno, arranged for shuttles to transport the wedding party to the Barona Valley Ranch and Casino Creek Ballroom reception area. 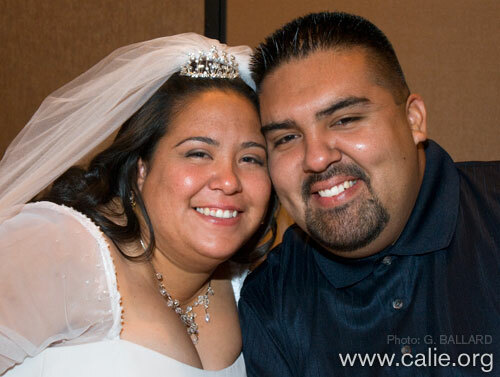 This Traditional California Tribal wedding in the Barona Wedding chapel is sponsored and coordinated by Southern California American Indian Resource Center, SCAIR administration and learning center is located in Alpine. 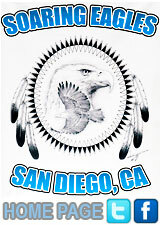 SCAIR both administers and participated in partnership affiliations with: San Diego Indian Center, Shirley Silvas is the program Director. 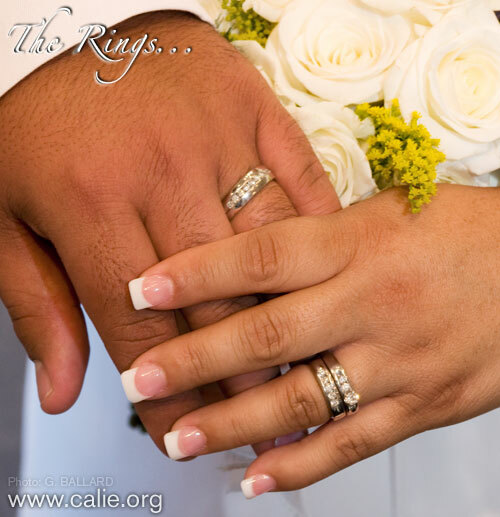 This wedding is the first major event of the prevention of out of wedlock pregnancies project and the Urban Tribal Temporary Assistance for Needy Families, TANF services. 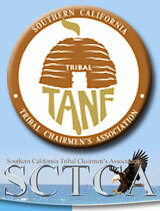 It is underwritten by a special grant from the Southern California Tribal Chairman’s Association. Wanda Michaelis, Cherokee, Executive Director of Southern California American Indian Resource Center, SCAIR and San Diego Learning center program coordinator, Antoinette Aleman, Cherokee, were part of the team in charge of the wedding decorations for the chapel and the Barona Valley Ranch and Casino Creek Ballroom reception. 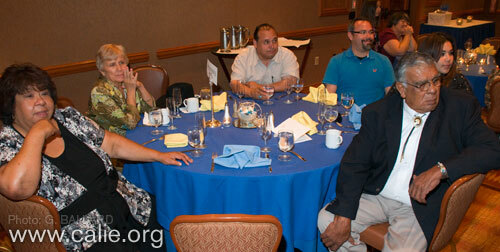 The tables are decorated with blue and gold Charger colors and seashore theme centerpieces. All tables are further decorated with lit votive candles for an elegant setting along with the three tiers and flat wedding cake. Sylvia Mejia, Juaneno, SCAIR Alpine administration receptionist and Melissa Aleman, Cherokee, assisted them. In the entryway are three Kumeyaay cultural montages of Traditional California Indian Art produced by the CALIE webmaster, Gary Ballard. 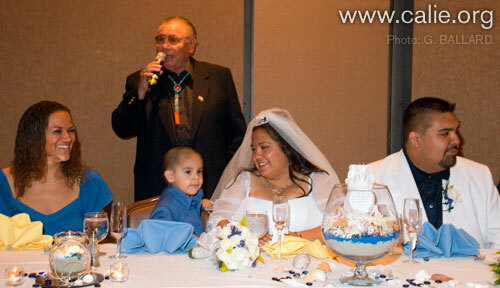 Randy “Burt Reynolds” Edmonds, Kiowa-Caddo, is the selected MC for the reception. 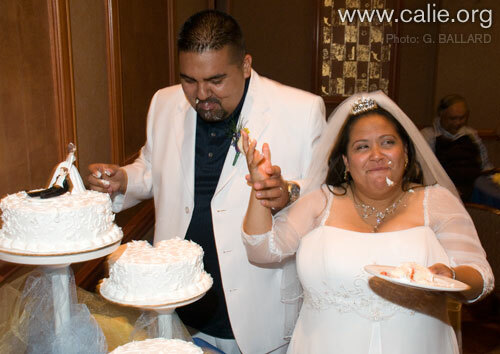 Randy calls for the married couple to come up to the table of honor and the Amador’s are greeted with thunderous applause! Inspirational and amusing are some of Randy’s best strengths as a host MC. 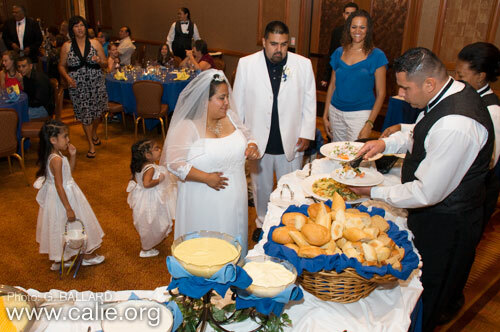 The married couple is to lead off the luncheon buffet, followed by elders and all the rest are on their own. In good spirit and nostalgic are the jokes about commodities that are voiced over the platter of cheese selections. Good food, good company and a great time together. Randy then briefly sketched out the activities for that afternoon’s reception. He then called for the glasses to be filled with sparkling apple juice for the toast to the happy couple. 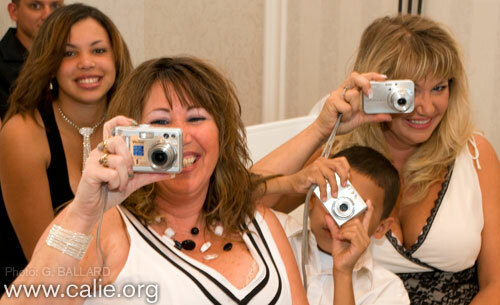 Then it is time for the cake to be cut and massive picture taking by scores of the family and guests. Randy calls for all those who wish to join in this celebration of life together. All is left is the garter and bouquet toss for the lucky one to dream on. Finally, as folks begin to mill about and look to the doors, there are many hugs and handshakes for the Amador’s doing the right thing by growing this Indian family and raising their Indian children. 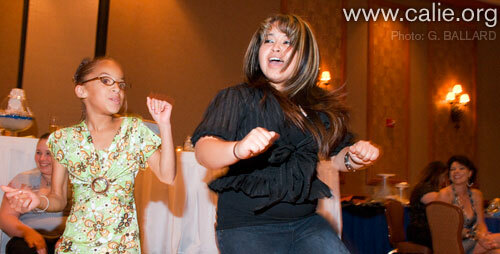 We hope to see each other at many more of these happy events. Randy Edmonds and Chairman Leroy Elliott talk prior to the wedding ceremony. 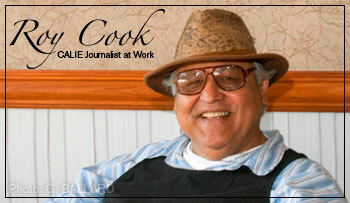 Ernie Salgado is pictured in the background wearing hat and sun glasses. 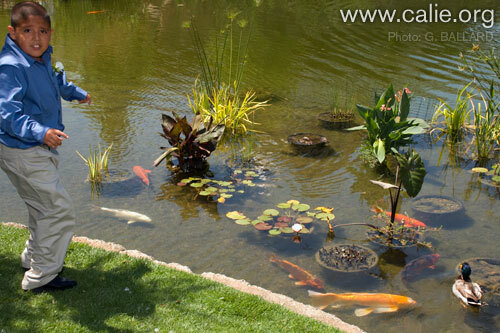 Barona Valley Ranch and Casino provided park-like setting for the tribal family event, Barona Indian Reservation, San Diego County. 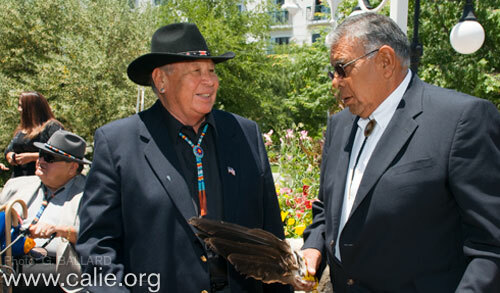 As chairman of the Manzanita Band of the Kumeyaay Nation, Leroy Elliott performed the Native American Indian wedding ceremony and married the young California Indian couple in the Barona wedding chapel. California Indian birdsingers Devon Alto, Tipai, and Louis Guassic, Ipai, sang traditional birdsongs during the ceremony. "Let's get the party started...". Newlyweds Mr. and Mrs. Amador. Rietta is a Maidu Indian, and Norman is Pascua Yaqui. 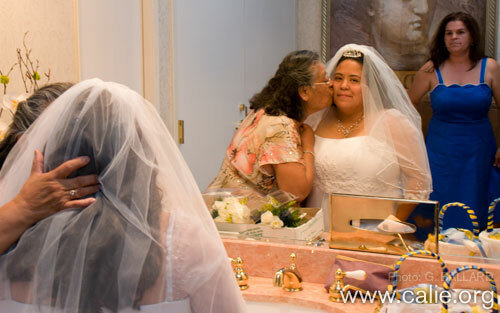 Watch this Native American Indian wedding movie short free on line (Flash Player required to see movie). 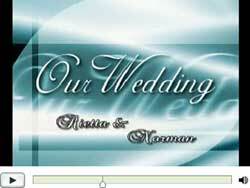 CLICK to see our 24x48-inch wedding poster.